Here are a couple of pictures of some heavy steel parts we cleaned back from heavily corroded condition to a pristine clean condition ready for coating. Blast cleaning, when applied expertly at the correct pressure, using the correct type and grade of media grit can be useful for a huge number of applications and can be both very aggresive but in trained hands also very gentle. For example, using gentle soda grit at low pressure we have successfully blast cleaned soft marble and sandstone statues and caused no damage to the underlying surface whilst at the same time we can remove the hardest coatings and deposits from steel. 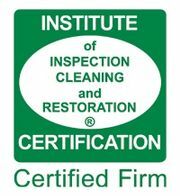 For any blast cleaning enquiries please give us a call 0131-660-0220 and we will be more than happy to help you. 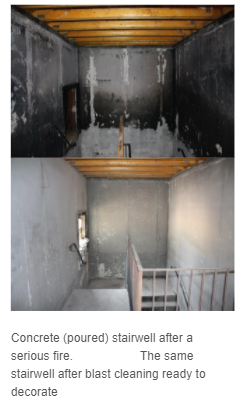 Here is an example of a concrete stairwell which suffered a fire. We cleaned this using blast cleaning and the finish we achieved allowed immediate redecoration of the surface.